From Michael J. Luzzi: As an attorney, father, and football fan, I’ve considered the issues of contact football programs in schools, and learned a lot in the last few years. Here are my conclusions. The concussion issue is one that the NFL has refused to acknowledge until forced to do so. High schools and colleges are now taking this issue very seriously by evaluating players before, during and after seasons. My first experience with this evaluation was when my son Andrew played football at the Williston Northampton School in Northampton, Mass. One of my son’s early pre-season itineraries listed a time slot for impact testing. I thought it was for some kind of conditioning; it wasn’t. Williston brought in a firm to test the kids prior to the season for concussion type issues. I later learned that Massachusetts required such testing. This was 5 years ago; they were certainly ahead of the trend. As a football fanatic, a football father (and someday hopefully a grandfather), I have really started to wonder whether my affection for the game, and its wonderful lessons, are worth the risk. I land somewhere in the middle. I love the game, but I do think limiting exposure to head trauma is important. So my take is that kids really don’t need contact football prior to high school. Teach technique and fundamentals at the younger ages. Play flag or touch, but refine all of the fundamentals. Then if a kid still has a desire for the game, jump to the other side when they are older. 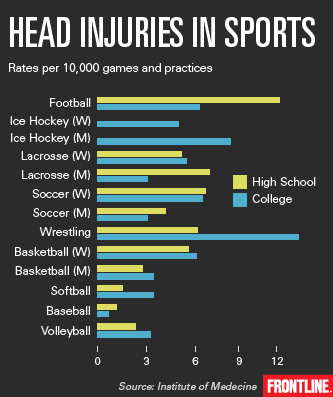 What brought this to my attention recently is the circulation of a Frontline article, High School Football Players Face Bigger Concussion Risk, sharing startling research on concussions among high school and college football players.